OT (Occupational Therapy) Forms (10) such as the Outpatient Evaluation, Note, Inpatient Evaluation, Home Health Evaluation, Notes, Discharge. The free medical forms for OT below can be modified to fit your small business or OT department. OT is a type of treatment that helps people across the lifespan participate in the things they want and need to do the therapeutic use of everyday activities (occupations). Occupational therapist and their assistants help many people including children with disabilities participate fully in school and social situations, helping patients regain skills that they lost from an injury, and providing support for older adults experiencing physical and cognitive changes. An individualized evaluation in which the client/family and therapist determine the person’s goals. Customized intervention to improve the person’s ability to perform daily activities and reach the goals set. A Re-Evaluation to ensure that the goals are being met and/or make changes to the intervention plan of treatment. Some companies (hospitals) have 2 or even 3 areas of OT including outpatient, inpatient and home health. OT Evaluation – This form is filled out by the Occupational Therapist on the patient’s initial visit after the patient is evaluated. This form is then signed and dated by the therapist and faxed to the patient’s physician who ordered the OT. In some instances (Medicare patients, etc.) you will need their physician to sign the OT Eval and fax back to you to file in the patient’s record. OT OP/IP Note – This form is filled out by the Occupational Therapist and Occupational Therapist Assistants who is performing the OT visits on the patient in the outpatient or inpatient settings. This form is also inserted into the patient’s record or file. OT Cold Pack Instructions – This form explains to the patient how to make their very own cold pack at home. OT Courtesy Call List – This form is to be filled out by the person in charge of making courtesy calls to remind the patients of their next visit. 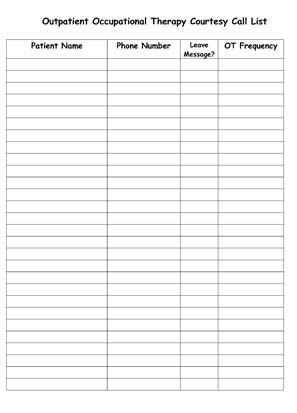 OT Work/School Note – This form is filled out and signed by OT/COTA for patients who need note for school or work. 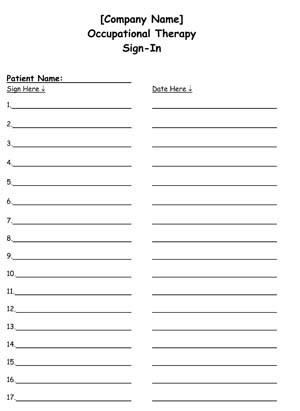 OT Patient Sign In Sheets – This sign-in sheet is what you have the patient sign when they first arrive to the OP OT Office before receiving treatment. This form is a legal part of their medical record and it is proof that they received therapy treatments on various dates. OT Evaluation – This form is filled out by the Occupational Therapist performing the evaluation of the patient in the hospital to determine patient’s goals and treatment plan. This form is then inserted into patient chart for physician’s review and signature. OT Evaluation/Re-Evaluation/Discharge-Physician Certification – This form is filled out by the Occupational Therapist and can be used for the evaluation, assessment only, admission, re-certification or discharge from Home Health. This form will be faxed to the patient’s physician who ordered the OT for him to review and sign and fax back to insert in patient’s Home Health record. Home Health OT Daily Visit Record – This form is to be filled out by the Occupational Therapist or the Occupational Therapist Assistant who is treating the patient at home to document the comments, observations, mental status, interventions, etc. on their patient visits. Home Health OT Evaluation/Re-Evaluation/Discharge – This is another form similar to the one above and is to be filled out by the Occupational Therapist. The therapist simply checks evaluation, re-evaluation or discharge on the top depending on what the case may be. As above, this form will also have to be faxed to the patient’s physician who ordered the OT and then after their physician signs the document they will fax it back so you can include it in the patient’s record or file.